On the European Taxi Fair 2014 for the first time the exclusive by faytech for a project partner developed taxi hardware solution is presented. 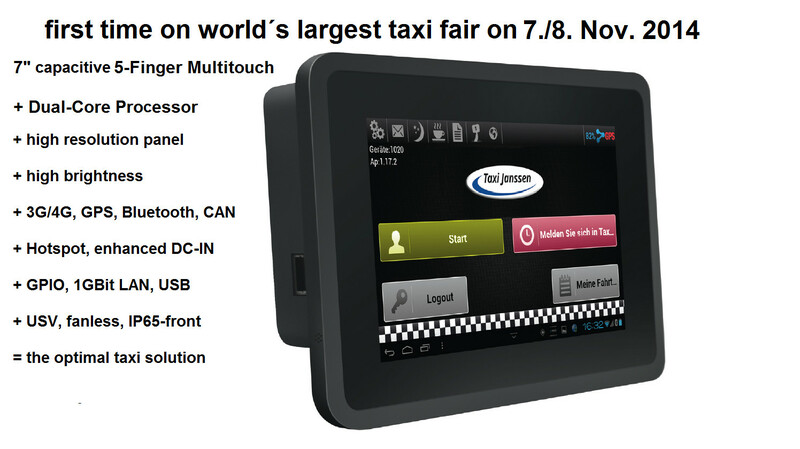 High-resolution, high brightness 7″ panel, capacitive multitouch, patented dust-proof and water-resistant front following IP65, 3G/4G, CAN-bus, Bluetooth, Push to talk, Wi-Fi hotspot, high-performance embedded processor, Android operating system and the available software application perfectly tailored to the needs of the taxi industry are the features that characterize the solution. The 15″ capacitive touch PC is one of faytech´s most impressive projects so far. The 8-36V DC-In Touch-PC, which will steer locomotives in South America, is rugged, fanless, IP67 and has numerous connections which were just possible to realize with faytech´s industrial mainboard series: 12x RS485+RS232 connectors, special button design (with backlight), Balanced Router (2x SIM cards), GPS+Glonass satellite navigation, Motorola TETRA Module TOM100, camera, USB3.0, Bluetooth 4.0, W-LAN, G-Force, Gyroscope, E-Compass, Accelerometer and 4-channel Video-capture card are components integrated into this locomotive Touchscreen-PC with a high brightness 15” panel and capacitive multitouch. Arne Weber of faytech ltd. talks about and demonstrates the differences between the monitor stands manufactured by his company. Arne demonstrates the flexibility and versatility of the company’s plastic stand design model #FTV75PSF included for free with each 7”-12” Touch Monitor that they sell. He also talks about faytech’s new metal stand design model #FTV100SF, demonstrating its stability and functionality, highlighting the engineering improvement made in the rubber pads section of the base, eliminating the pads coming off the base on the initial product release when the stand was removed from a tabletop. faytech will replace the pads on any stand base previously shipped at no charge to their customers. Arne Weber of faytech Co., Ltd. demonstrates his company’s 8″-22″ All-in-One Touchscreen PCs built around faytech’s proprietary designed mainboard (manufactured exclusively by the industrial division of ASUS). Each of faytech’s fanless industrial Touchscreen PCs can be manufactured using a number of different touch technologies (resistive, capacitive, SAW or IR), and with a variety of connectors to fit any industrial use. Customization is also available including high brightness and IP65/IP68 ratings for outdoor usage. The standard 8″-22″ Touchscreen PC models comes with a 5-wire resistive touchscreen, industrial LCD Panel with LED backlight, Intel Atom N2600 chipset with AMD’s Caicos mobile HD7400 series chipset with dedicated 512MByte RAM (supporting WinXP, Win7, Win8, Linux, 32Bit, 64Bit), 2GByte RAM, 30 or 60GByte SSD, W-LAN and numerous USB and serial connections. Arne Weber of faytech Co., Ltd. presents his company’s new series of 7″-15″ modular Embedded LCD Touchscreen PCs designed for use in industrial applications and easy to integrate into any industrial solution. The embedded Touchscreen PC runs with either Cortex A8 or Cortex A9 Texas Instruments chipset with 1GHz or 1.2GHz, supporting CAN bus, I2C bus, network, USB, serial port and many more external connections and customization options. Embedded Windows (WinCE5.0, WinCE6.0) and Linux are offered as operating system options, and each device comes with either 4-wire resistive or optional projected capacitive touch panels.